A coalition of Niger Delta militants has called for the sacking of Real Admiral Apochi Suleiman as the Commander of the Joint Task Force (Operation Delta Safe), alleging his involvement in illegal oil bunkering in the region. The group known as the Coalition of Niger Delta Agitators also warned that it would be difficult to implement the 2018 budget if the current leadership of the JTF was allowed to continue in the Niger Delta region. 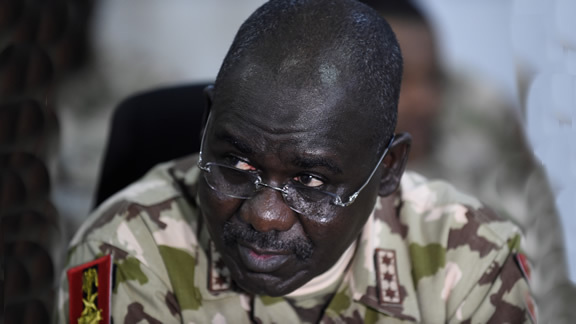 It noted in a statement issued on Thursday and signed by 13 different militant groups that it had investigated allegations against the current leadership of the JTF and had found the (JTF, Operation Delta Safe) culpable, adding that the activities of the joint task force was adversely affecting the economic growth of the region and the entire country. Signatories to the statement were John Duku of the Niger Delta Watchdogs, who is also the convener of the coalition; Ekpo Ekpo (Niger Delta Volunteers), Osarolor Nedam (Niger Delta Warriors), Henry Okon Etete (Niger Delta Peoples Fighters) and Asukwo Henshaw (Bakassi Freedom Fighters). Other signatories of the statement were Inibeghe Adams (Niger Delta Freedom Mandate) Abiye Tariah (Niger Delta Development Network), Ibinabo Horsfall (Niger Delta Movement for Justice) and Duke Emmanson (Niger Delta Fighters Network), Joshua Ebere (Renewed Movement for Emancipation of the Niger Delta), Jeremiah Anthony (Movement for Actualisation of Niger Delta Republic), Francis Okoroafor (Niger Delta Freedom Redemption Army) and Nelson Walter (Niger Delta Liberty Organisation). The coalition specifically called on President Muhammadu Buhari to remove Suleiman as the JTF commander in the oil-rich region, even as it urged the Economic and Financial Crimes Commission and other relevant bodies to immediately begin a probe of the activities of the JTF commander. The coalition said, “After receiving report from our intelligence and surveillance units and all the affiliate groups of the Coalition of Niger Delta Agitators across the region and beyond, which we mandated to investigate the activities of the JTF commander in the Niger Delta, the shocking report indicted the JTF and its leadership of complicity and involvement in illegal oil bunkering of great magnitude in the Niger Delta. “After careful deliberation on the report, we call on the President and Commander-in-Chief of the Armed Forces to order the immediate removal of the JTF Commander, Rear Admiral Apochi Suleiman, from the Niger Delta region. “We, therefore, call on the Economic and Financial Crimes Commission, Independent Corrupt Practices & other related offences Commission, Office of the National Security Adviser and military authorities to, as a matter of urgency, remove and probe the activities of JTF Commander, Rear Admiral Apochi Suleiman, before it is too late. “We also use this medium to call on the Ministry of Defence and military authorities to restructure the Joint Task Force (Operation Delta Safe) with immediate effect in order to avoid breakdown of law and order because we will not sit down and watch them connive and steal millions of crude oil barrels on a daily basis.” When contacted to speak on the allegation against Suleiman and the JTF in the region, the spokesman for Operation Niger Delta Safe, Ibrahim Abdullahi, insisted that he would not speak with our correspondent until he met him in person.